This Arthur R. Warner Co. precision boring bar uses high speed steel inserts. Combine the advantages of high speed steel cutting tools with the convenience of indexable tooling. The minimum boring diameter is 0.330". The Arthur R. Warner Co. is a family-owned American manufacturer of high speed steel products with specialization in cutting, shaping, pre-grinding, heat treating, and finish grinding of premium grades of flat high speed steel. 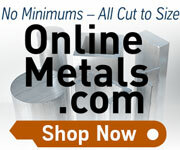 Their quality is excellent and LittleMachineShop.com is proud to carry their products.